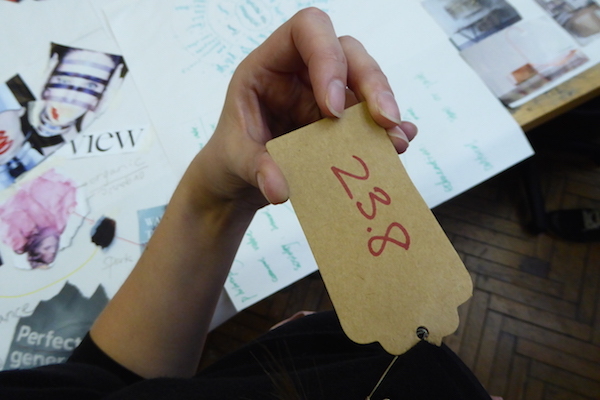 At the end of last week, I was invited by the School of Jewellery at Birmingham City University to speak and facilitate a workshop at their ‘Jewellery Futures Symposium’ event. 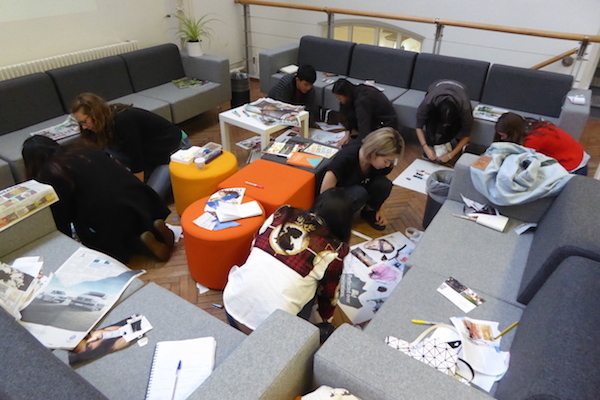 As many of the undergraduate students studying at the School of Jewellery are international, with a majority coming from the East Asia region (as the event visualised…some from over 6,000 miles away! 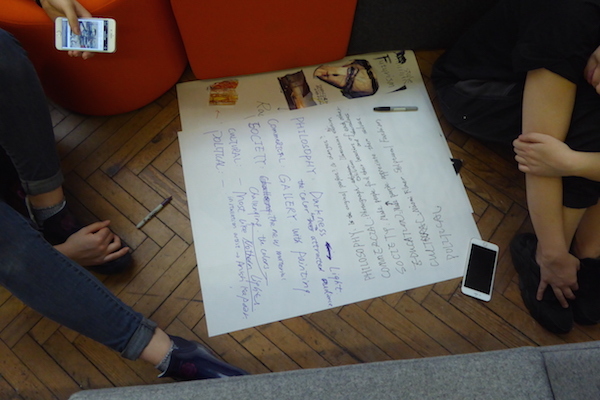 ), the symposium aimed to focus on cross-cultural education and awareness, the experience of culture-shock (or cultural fear), the process of change and transition to the UK, and how to assimilate to new cultural influences and approaches to learning. Alongside myself, perspectives were provided by Emma Daker from Craftspace (I actually knew Emma from my Wolverhampton Art Gallery days as she used to work at Bilston Craft Gallery, which is part of the same arts and museums sector), designer-jewellery Li-Chi Wu who is an alumnus of the School of Jewellery, and Laura Cave from Just Trade. 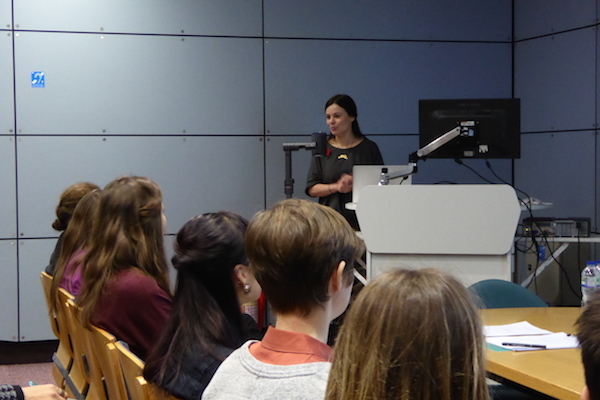 With a morning of short talks from the four mentioned speakers and an afternoon of extended workshops, the day provided the opportunity to network, critique, examine, share and exchange…delving deep into the idea of #jewelleryfutures, specifically through the themes of globalisation, mobility and migration. 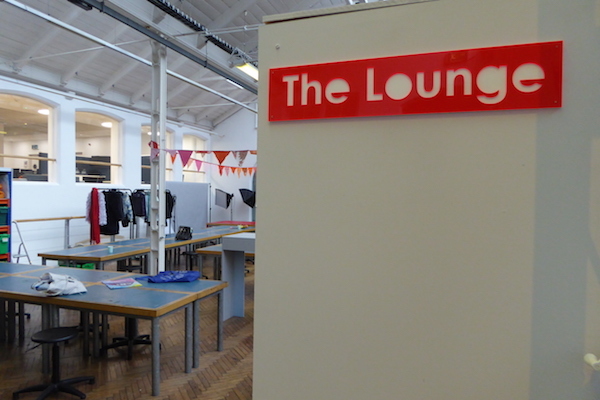 When we arrived at the School of Jewellery, we were all asked “Where is your home?” A question I ALWAYS struggle to answer as I am not sure what to say. Even some of the students didn’t know either. 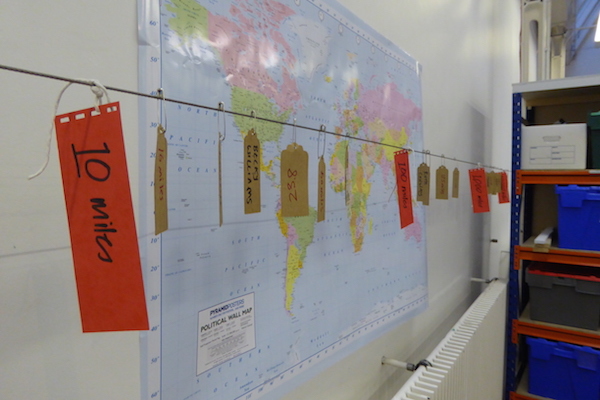 I said “It’s where I hang my hat”…whilst others gave their postcodes and city names. Eventually, I gave my Stafford postcode (23.8 miles away, written on the back of my name tag) mulling over the question again and again. It made me think of the TED talk ‘Don’t ask where I’m from, ask where I’m local’ by Taiye Selasi…a must watch that deserves its own blog post so I won’t write about it here. After all the distances and miles were collated, it highlighted ground covered…the closest home just over 2 miles away and the farthest 6098 miles away in China. An incredible distance travelled and therefore, cultural wealth in the room that day. 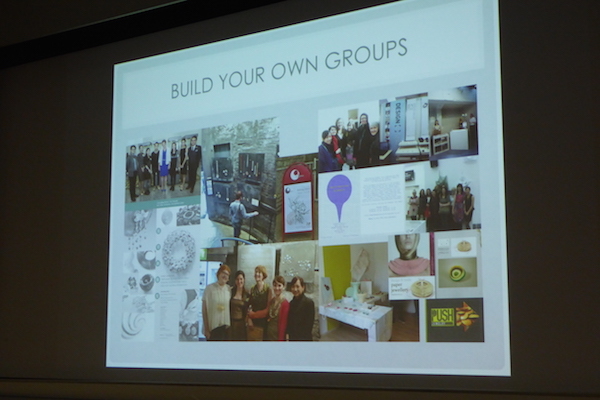 Sian Hindle from the School of Jewellery gave a brief introduction, stating #jewelleryfutures was to celebrate cultural diversity and acknowledge the cultural and dialectical differences. Sian said, I haven’t travelled very far geographically, but I have crossed other boundaries – interdisciplinary boundaries. She than cited a visual metaphor assimilating weather isobars to the understanding of regional dialects known as isogloss. A nice reinvention and appropriation of language. 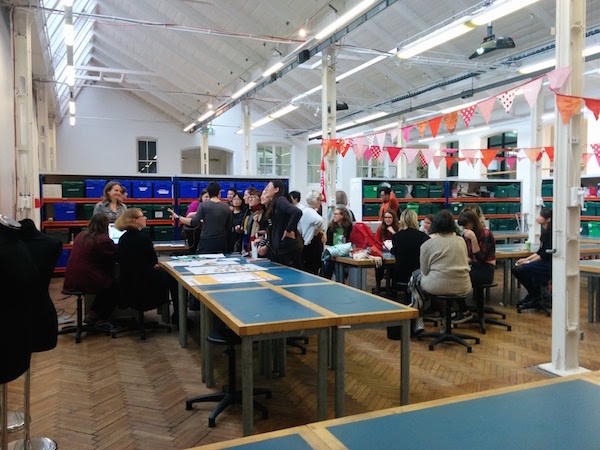 Residency 1: Route to Revolution – creating a limited edition run of ceramics on show at the Community Gallery, Birmingham Museum and Art Gallery. ‘Story Meadow’ (2013) – Tales of migration to Birmingham. How do you feel migration impacts on the city? How did you end up in Birmingham? How do you feel visiting Birmingham? Migration as a theme. Participants often have no prior experience. 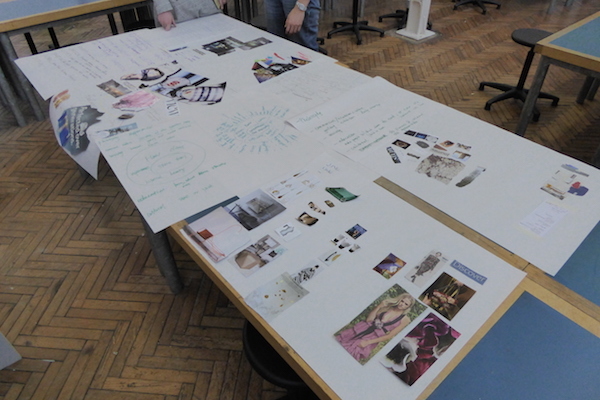 Collective design process influenced by travel, trips and experiences. They become ambassadors of Birmingham, showing what they’ve learned. Different ways of coming to making…traditional routes such as through university and alternative ways through community practice like Shelanu. 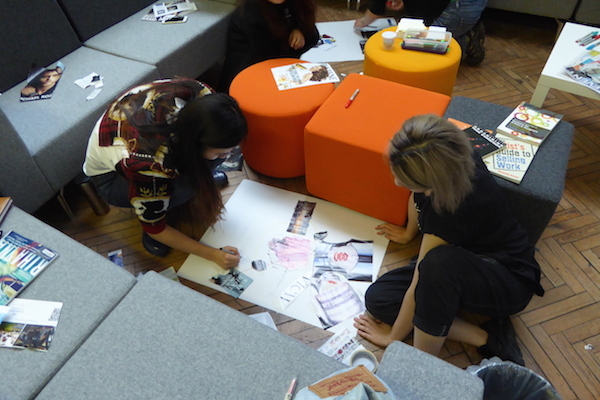 The importance of sharing the work that the participants make and do. Shelanu gives women a place to come to learn new skills, new network, integration into the city, becoming ambassadors in Birmingham, finding cultural citizenship in the UK. It also increases the diversity of the industry – how did the industry respond to this? There is a shift change happening, we are being asked to do more things. 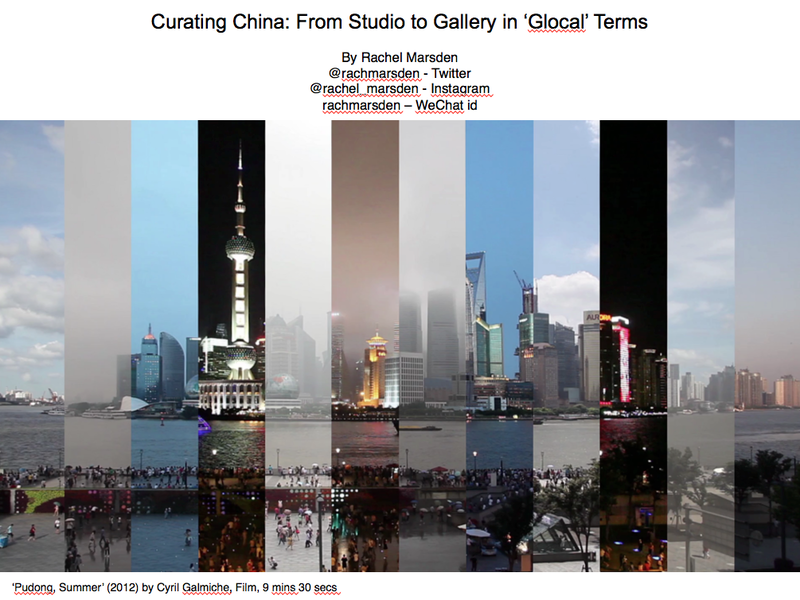 I was up next speaking on ‘Curating China : From studio to gallery and beyond’. 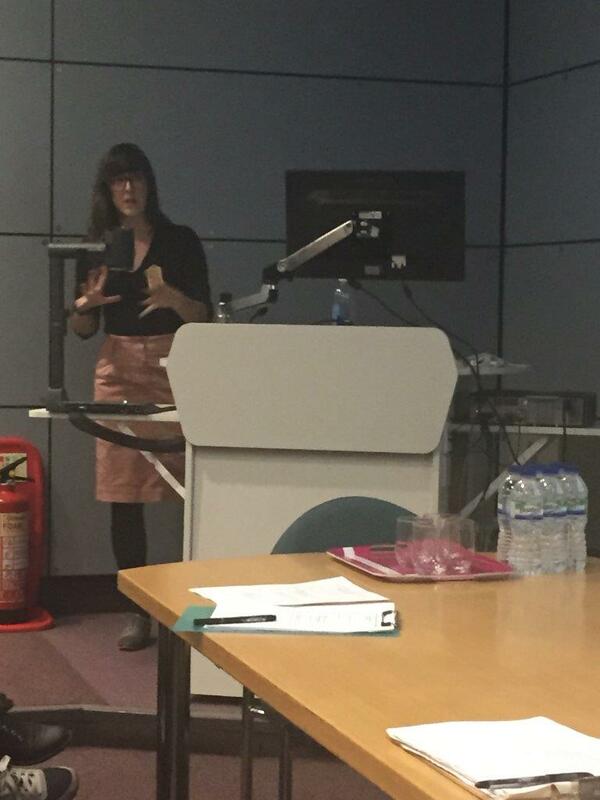 The lecture presented reflections into my creative career between China and the UK looking at the local-global connection through a variety of curatorial projects and platforms from degree show to art fair, pop-up exhibitions to art festivals…basically the wordgirl curatorial back catalogue integrated with my life ethos…that of communication, sharing, investigating, documenting, writing, creating communities of practice and…not sitting still. The latter I am very good at…every, single, day. After my lecture, the only question I was asked was as to whether I knew Mandarin Chinese and whether this had hindered any of my work or career progress. I responded saying obviously there are issues with translation and translators, but there is an amazing power in communication without words through gesture and common ground. If verbal communication isn’t possible, you find other ways to communicate…some of my most memorable experiences from China were when there was the most difficulty with language. It then becomes all about viewing, seeing and experiencing, using a different set of senses. 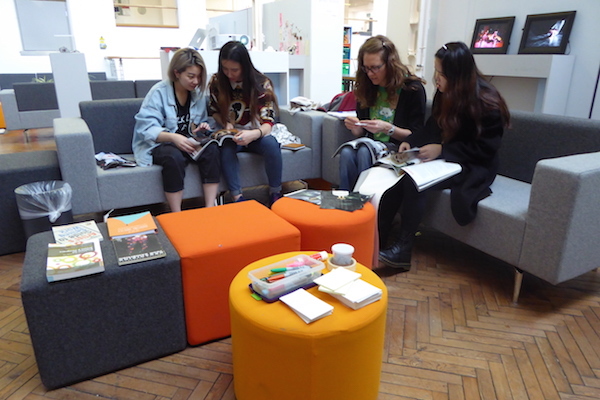 During the morning coffee break time and time for chatter, I spoke with one of the other speakers, former BCU jewellery student now a designer-jeweller, Li-Chu Wu. 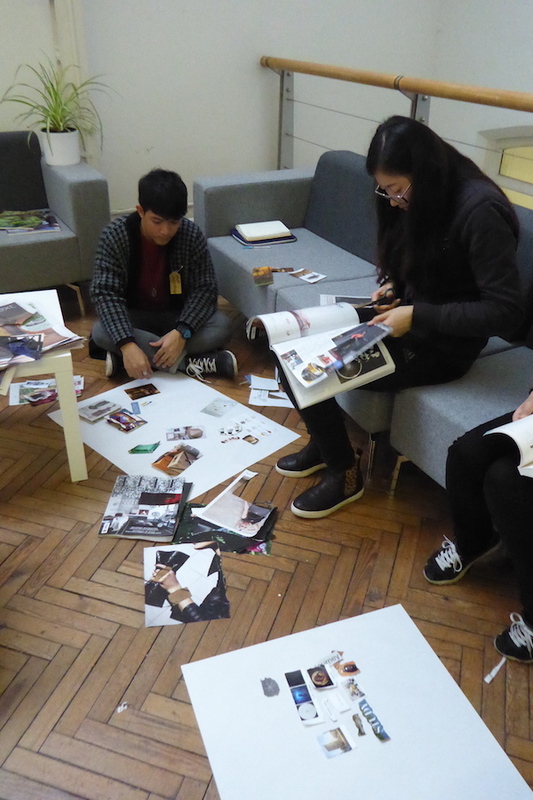 Originally from Taiwan, living in Birmingham for over six years now, she told me about her practice and negotiations of the UK creative climate and the difficulties in sustaining a practice. 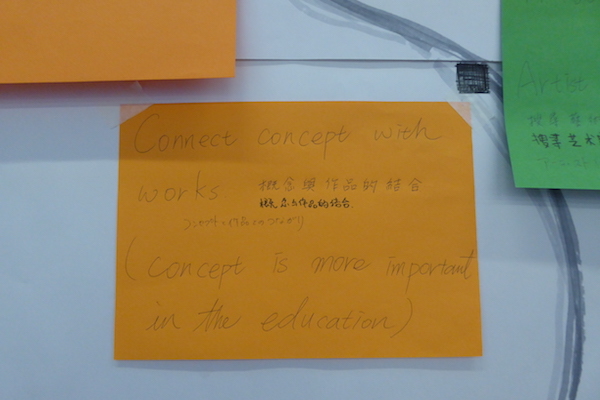 When asked about my work (as she’d missed the beginning of my presentation), I told her about the new MA Contemporary Arts China course I am currently co-creating (co-organising? co-writing? 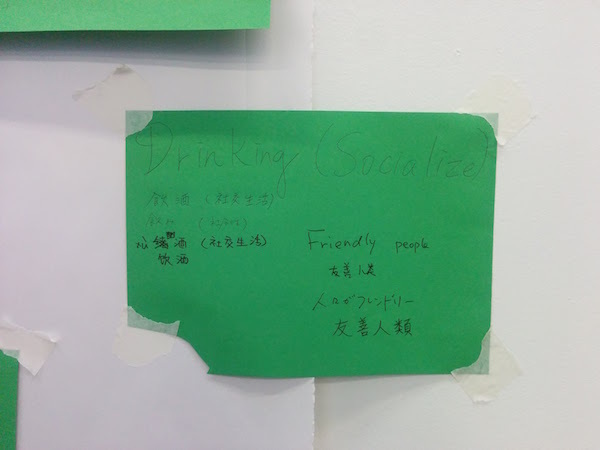 I’m not quite sure what verb to use) with the Centre for Chinese Visual Arts (CCVA) and she said that she wished she had been taught more of the professional practice side of things, arts management and arts marketing. This made me think back to another MEd session and Sonia Hendy-Isaac’s comment that ” your alumni is your most powerful tool”. Li’s comments were useful and will definitely be taken back to the CCVA team. Li’s presentation was next on the ‘Study and Commerce across East and West’. Originally from Taipei, Taiwan, she sees herself as a “designer-jeweller”, currently working as a full-time graphic designer full-time and a part-time jeweller. 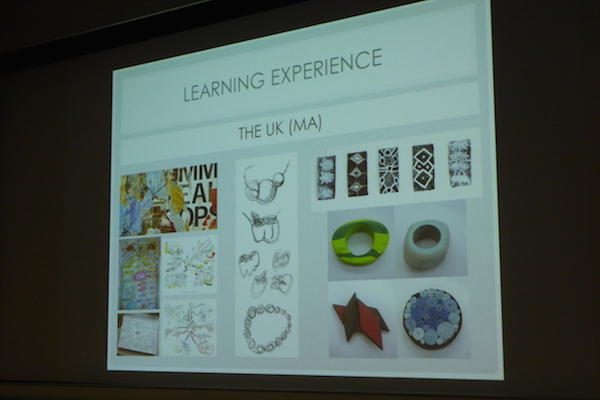 She spoke of her jewellery journey in the School of Birmingham and coming from Taiwan, referencing the differences in her learning experiences between Taiwan (three years undergraduate) and the UK (three years undergraduate and one year postgraduate) at undergraduate and postgraduate level. In Taiwan, it is very much about building the technical skills, for example professional sketch techniques, basic product design and gemology, alongside fine jewellery skills. She stated ‘everything we learn is quite straight forward and step-by-step. 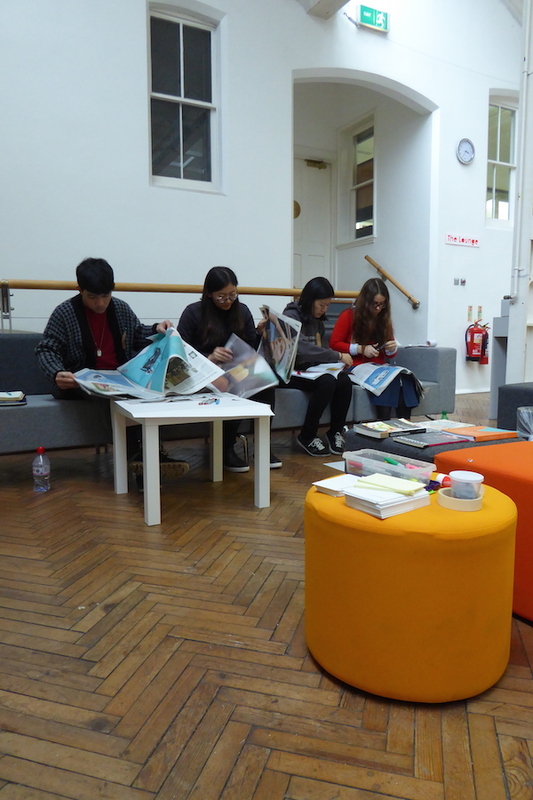 We don’t stop and think about what we are doing at each stage.’ In the UK, it is more about creative method, critical thinking and creative narrative. She spoke of the importance of sketching, mapping, research, testing, experimentation as part of the educational process in the UK. 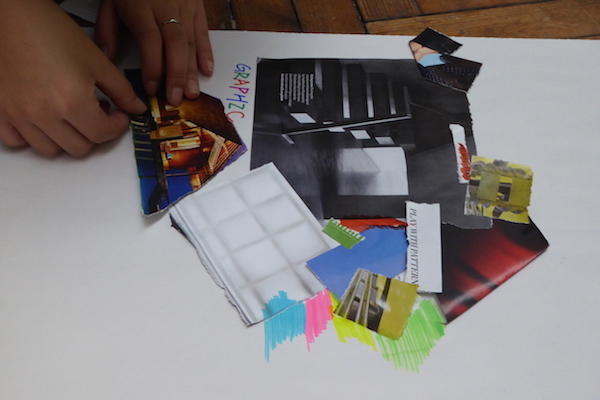 It creates new learning possibilities…creates different ideas as to how your work could develop, making your work more innovative with technique and skill. The final works she presented were from her paper jewellery collection that were simply BEAUTIFUL and struck a cord with my paper arts practice, not on this level though. So intricate, delicate and distinct. 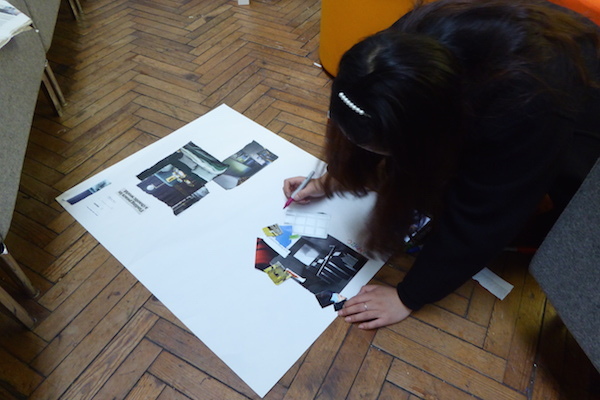 Li went on to state the importance of exhibiting your work and making application to projects and exhibitions such as New Designers, creating a personal image or brand presence for you and your work, images and the visual representation of your work. 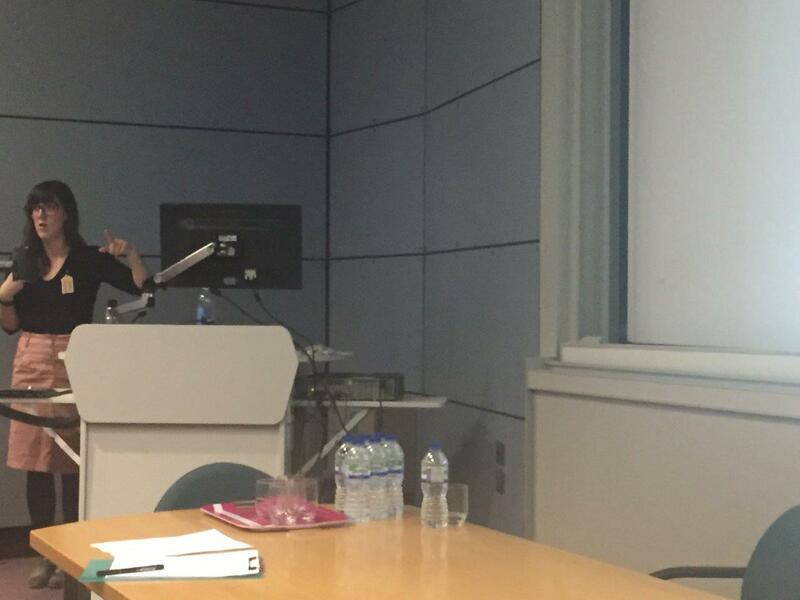 She finished her presentation by speaking of globalisation, and the importance of returning back to Asia for context. In Asia, there are cheaper production costs versus the difficulty of getting certain resources. 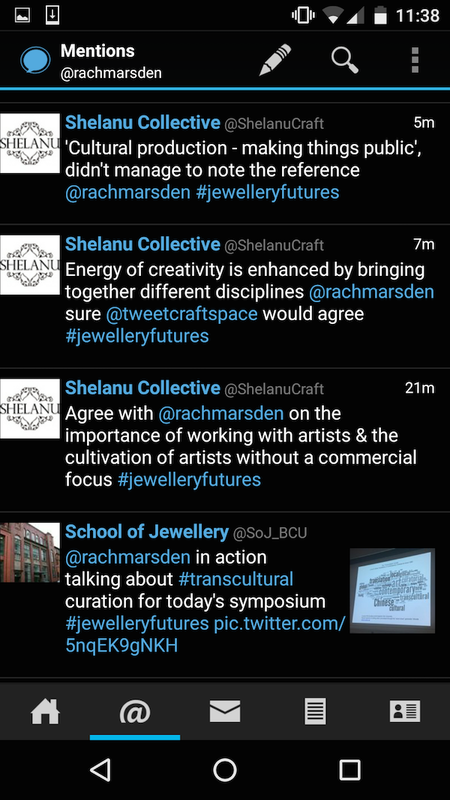 Also the importance of social networks and getting involved in publications…citing her inclusion in ‘Paper Jewellery’ book by Sarah Kelly and gaining work through social media. Li stated how important it is to keep in touch with your education and university, your educational community, fulfil your connection with your community. Also to have an awareness of international market. 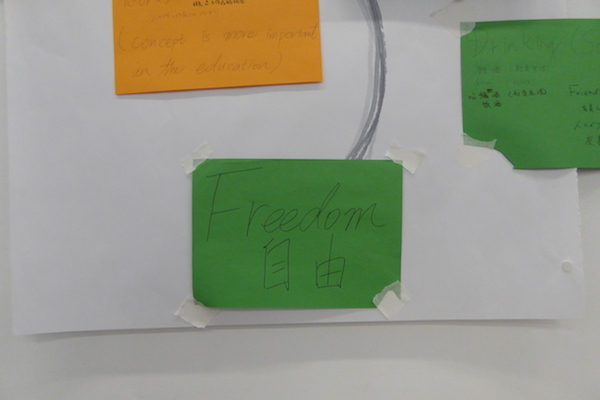 It was great to hear a practitioners point of view on the themes and subject. 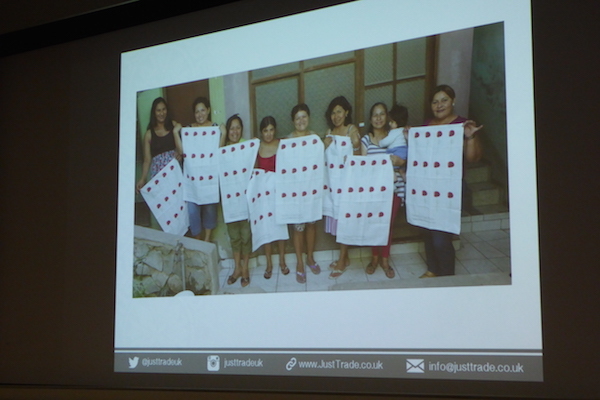 The final speaker was Laura Cave from Just Trade speaking on ‘Just Trade: Values and Development’ – a business model that allows indigenous craft makers to develop their products and find markets in the West. We were immediately confronted with the words “Working Collaboratively” on Laura’s first slide, which was an undercurrent to the whole day. 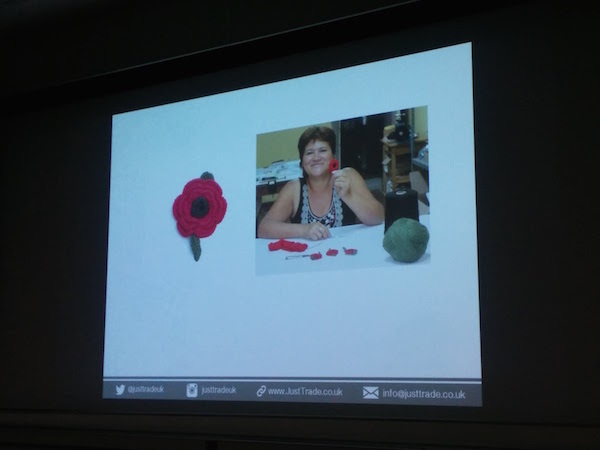 She cited international partnership projects where through communities of practice with Women from these nations and regions, products are created to be sold…such as, last year selling over 13,000 handmade crocheted poppies at the Imperial War Museum, and unique crocheted silver jewellery at the V&A…and so many more places! It was incredible to hear about all the partners the project has, is and will be working with into the future. 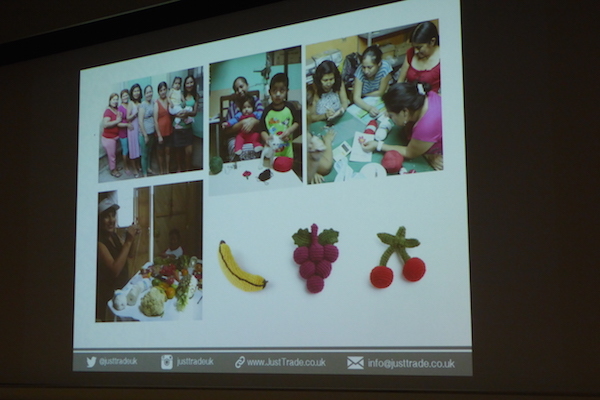 She questioned “How do these projects make a difference to people’s lives?” Allowed people to raise money to back for medical care, education, travel and more…the importance of fair trade and social change. After a pot-luck lunch it was time for workshops. 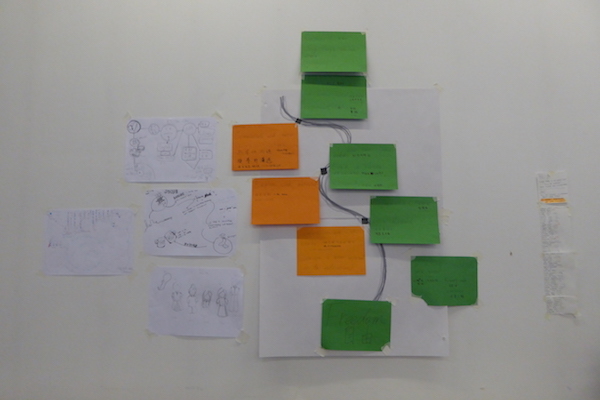 My workshop was on ‘Profile Building and Concept Mapping’, helping students to understand how to make sense of their practice through self-publishing and promotion online, and through concept mapping. With eight participants for the session, I began by giving a brief presentation into different social media types, their uses and how each platform critically engages with the world – basically the hierarchy of social media types. 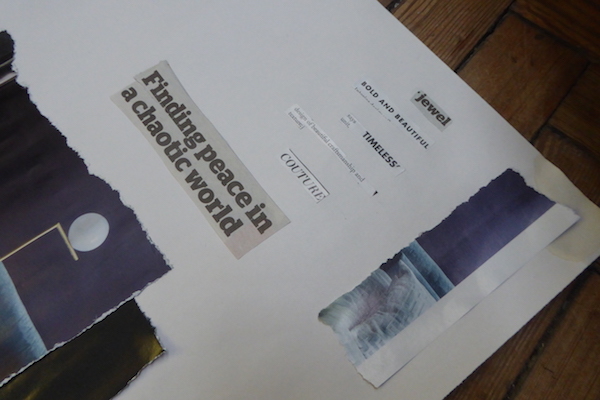 The first exercise asked the students to search through current magazines and newspapers to find words and images that best defined and communicated their practice, knowing that for some language might not be easy or come naturally. Working in pairs, they then had to find common interests between their and their partner’s practice. 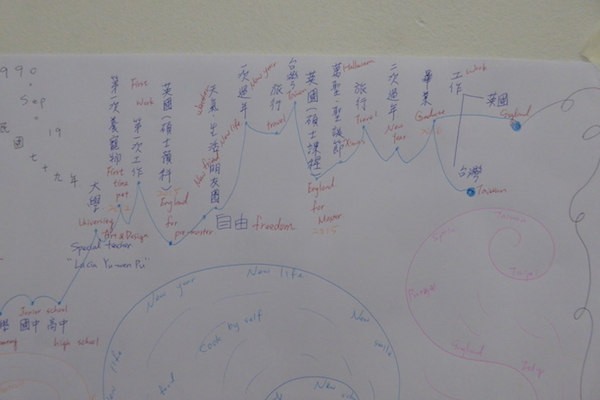 This textual and visual representation of their practice then became the core of their concept map. Around this core, they wrote down six themes – education, philosophy, commercial/economic value, cultural/culture, society and political. 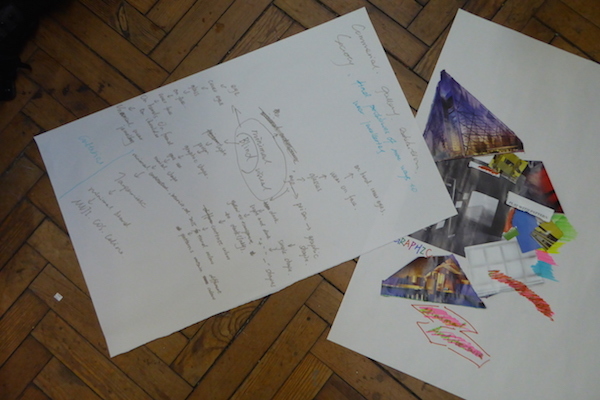 From this, they were then asked to think about and write down words, ideas, themes, thoughts, subjects that linked their core concept to each of the six themes…as shown below, you can see the variety of responses. 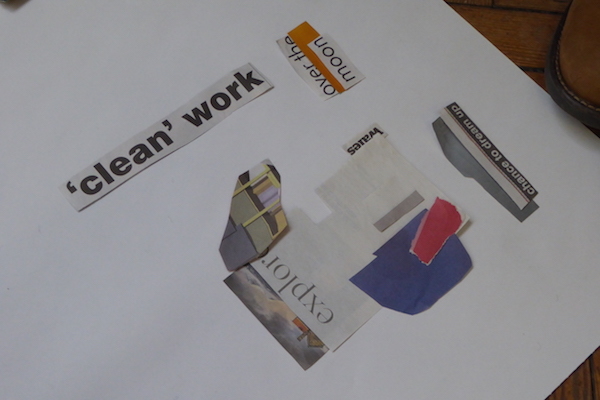 This started to expand their field of enquiry, moving them away from their personal associations to the concept. 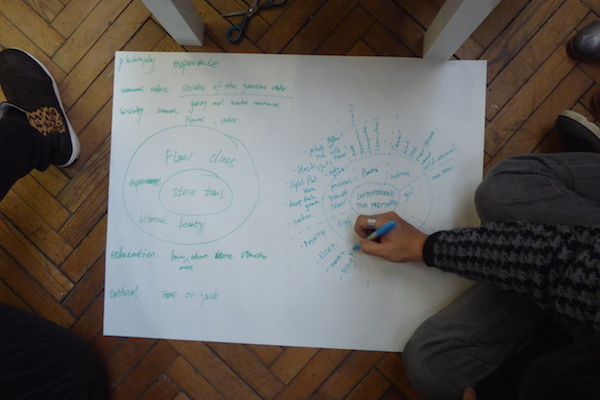 To think wider and deeper…ultimately getting them to think about why they are doing what they are doing and for whom. How is their jewellery placed in the world? What do they want it to say? How do you want the jewellery to make people feel? Who are the people you would like to see wear/use/experience your jewellery? What does it say about you as a jewellery artist/designer? I didn’t expect them to come up with final conclusions, more act as a trigger for enquiry, and I think it worked! 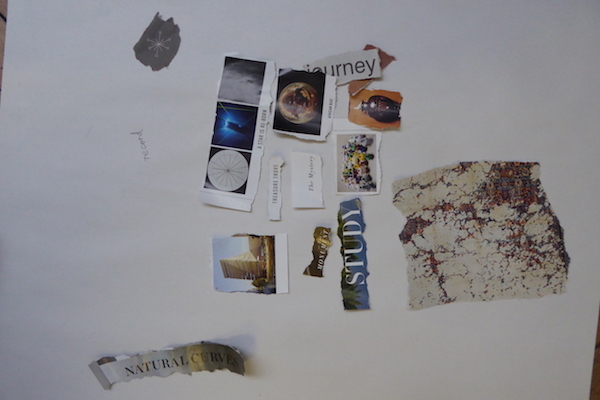 One of the other workshops (which I wanted to attend for my own research), looked into ‘mapping the learning journey’…very apt to my MEd Academic Practice studies right now! When it was time to share findings and outcomes from the afternoon, this workshop highlighted the diversity of languages and cultures present there that day, specifically from East Asian regions; the need and want for a type of freedom, especially from parents to follow their own creative paths; how concept is more important in education, and creating concept is hard to learn and finally, how a lot of the students’ learning journeys are defined through British and International traditional events and social engagements, which funnily enough, home students don’t really engage with to the same degree. Do internationals engage more with home tradition? I reference this against my time of living and working in China, but I feel it was different there as tradition is a huge part of Chinese life. I certainly felt a need to celebrate Christmas more! Tradition happens through a different history, representation and dynamic here in the UK…somewhat poignant on bonfire night and weekend, now leading up to Christmas. A fantastic day that has provided so much food for local to international thought. Also great online conversations through Twitter throughout!